With 3ds Max's MeshSmooth modifier, I'm able to smooth GTA SA's meshes automatically (and fix bugs caused by MeshSmooth) easy and fast. I started MeshSmoothing country2n.ipl two days or so ago and is nearly completed (might be released tonight, or tomorrow). 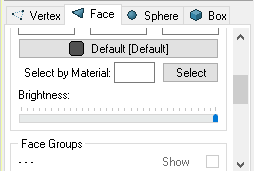 There's a preview mod of this MeshSmooth project already released by me. Bugs fixing and cols replacing are left to do. Average size per MeshSmoothed .dff from countryn2.ipl = 250 kb. Highest size of MeshSmoothed .dff from countryn2.ipl = 950 kb. Polycount is low and still looks good. Editado pela última vez por Zeneric em 10 Fev 2019, 14:25, em um total de 7 vezes. Finally... Firefly always wanted this. Did you use her tutorial? Her tutorial's for Zmodeler/Blender. This is all 3ds Max. Her tutorial inspired me to try something similar with 3ds max, tho. I will post a video tutorial of MeshSmoothing models on 3ds max, eventually. Editado pela última vez por Zeneric em 01 Fev 2019, 19:28, em um total de 2 vezes. Please, continue to convert the entire desert. And the rest of the map if you can; the mod looks amazing if they convert all the rest of the map. I fixed the lighting and col materials. 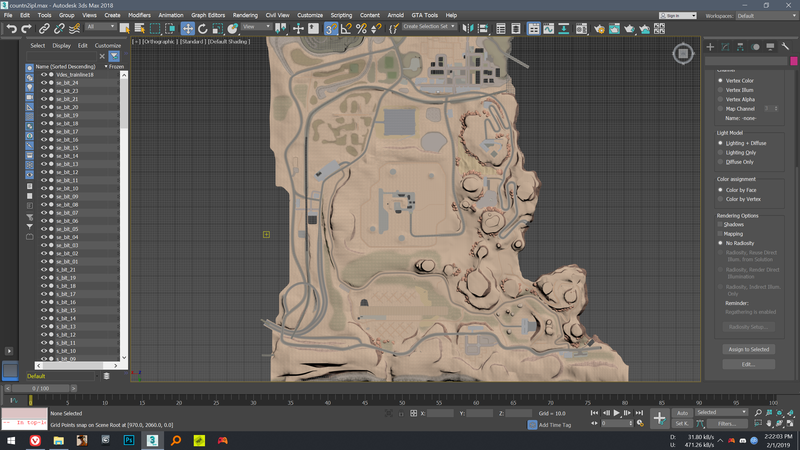 Now CJ, cars, peds etc doesn't get dark, the terrain is now sand (not more concrete) and the procedural vegetation now works. However I did this quickly just to make the mod more usable, so there may be flaws, especially the rocky parts, they are still concrete. Thanks. How did you fix the lighting? Editado pela última vez por Zeneric em 02 Fev 2019, 14:21, em um total de 1 vez. Editado pela última vez por Junior_Djjr em 02 Fev 2019, 15:44, em um total de 1 vez. nice.Hope.You'll do more of this. some colsurfaces are messed up/bugged. How did you fix them? What is your way of transferring colsurfaces from original to modded with the colsurfaces intact? Editado pela última vez por Zeneric em 03 Fev 2019, 16:33, em um total de 2 vezes. I didn't do this and I think there is not a way to do it, after all, it's totally another mesh, I just did a quick fix manually. Thought there'd maybe be a better way to do colsurfaces effectively. I'll tweak colsurfaces manually then. I restarted the countryn2.ipl MeshSmoothed project yesterday - I want to ensure the project's quality to be as high as possible and at least almost bug-free. So, time be a bit longer. 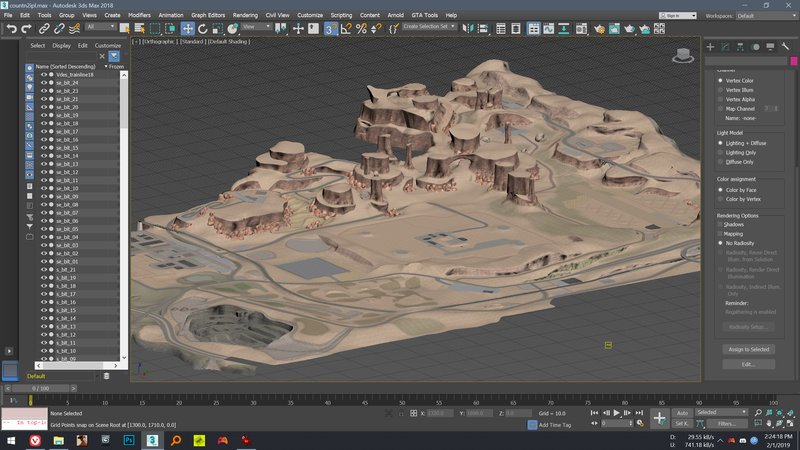 Colsurfaces and lod meshes are left to do (and finding more holes/gaps to fix, and etc minor things). Editado pela última vez por Zeneric em 03 Fev 2019, 18:18, em um total de 2 vezes. just put in dffs folder, and replace. Almost all white holes/lines are fixed. Most of white holes/lines are replaced with gray/black color (gray/black color is less noticeable/irritable than white). Because some meshes are tweaked/updated to eliminate the white hole/line bugs, some of their colsurfaces/cols are now bugged. Next update will include colsurface/col fixes. Editado pela última vez por Zeneric em 10 Fev 2019, 14:26, em um total de 1 vez. Prelight and Area 69 fixes.